As our national hero Datuk Lee Chong Wei touches down on home soil to throngs of adoring fans at KLIA early this morning, the data is in from Sunday’s legendary Men’s Singles final against China’s Lin Dan. Despite falling just short of Malaysia’s first Gold medal in an Olympic games, #DLCW (Datuk Lee Chong Wei or Don’t Let China Win) united the country and some say even the region (with tweets from our neighbouring Singapore supporting our hero) garnering almost half a million Twitter mentions on Sunday.According to twitter, there were 16,847 tweets per minute mentioning the outcome of the Sunday match. 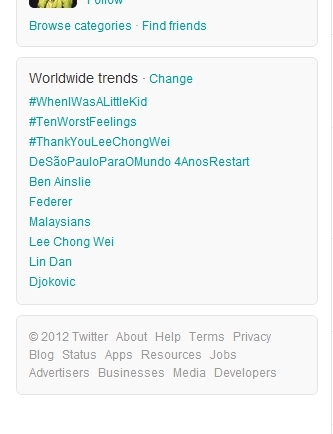 The mentions of Lee Chong Wei himself at @Lee_C_Wei spiked at around 9,200 tweets per minute. That is nearly double Lin Dan’s mentions on twitter. @Lee_C_Wei also has over 50,000 new followers on Twitter in 24 hours after his match. After tweeting the saddest 2 words that have ever been uttered following his loss: “I’m sorry” as well as a tweet to Yahoo Malaysia that said “Sorry I Could Not Get Gold”, the Twitterverse rallied together with words of support for him with the hashtag #ThankYouLeeChongWei which proceeded to trend worldwide at number 3. From the team at Lowyat.NET as well as our sister sites Hype.My, Wanista.com and lipstiq.com, we welcome you home Datuk with open arms, a hero and a man that will go down in time as a legend in both Malaysian Sports and culture in general. For uniting us all for a single cause, and being selfless, shedding tears for your country and not for your self, we say #ThankYouLeeChongWei.